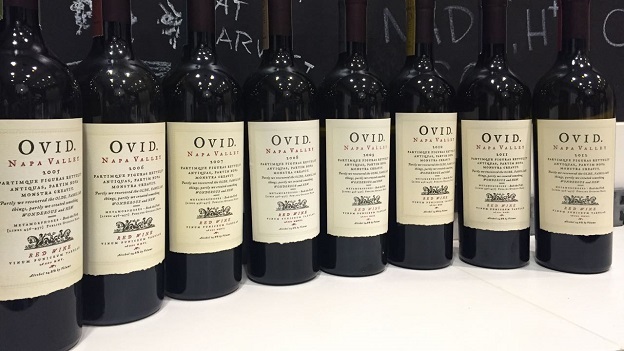 Ovid is one of the most exciting new entrants in the world of premium Napa Valley Cabernet Sauvignon. Since their first commercially released vintage in 2005, Ovid has shown what is possible on Pritchard Hill’s Long Ranch Road sector, a stretch of vineyards that starts at Aril, on the lower slopes of the mountain, and winds its way past several top estates, including Brand, Montagna, Martinez, Nine Suns and Colgin, before reaching Ovid. This vertical provided a rare opportunity to track the estate’s evolution from the first release to the present. Ovid is one of several Pritchard Hill properties that was carved out from the larger 1,000-acre estate that once belonged entirely to the Long family. In 1998 Mark Nelson and Dana Johnson purchased two parcels on Pritchard Hill with the intention of building a home. Entering the wine industry was not in the plan. Nelson’s background was in the medical software industry (Nelson had sold his company, Ovid Technologies, earlier that year), while Johnson’s career was in information sciences. 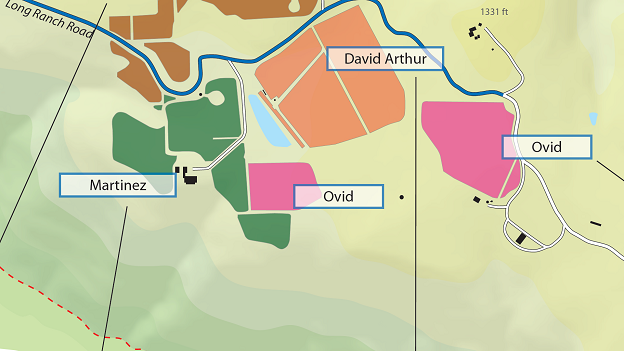 A meeting with noted viticulturist David Abreu was enough to convince Nelson and Johnson that they had, in fact, purchased land with extraordinary potential. Abreu began developing the site in 2000. Shortly thereafter, Nelson and Johnson added a third parcel to complete what today is the Ovid estate. Managing partner Janet Pagano, winemaker Austin Peterson and consulting winemaker Andy Erickson were brought on to round out a team that has been together pretty much since the beginning, a rarity by the fast-paced standards of Napa Valley. Nelson and Johnson named their new winery Ovid, after the Latin poet Publius Ovidius Naso, whose 15-volume Metamorphoses chronicling the history of the world through creation to the time of Julius Caesar, is considered one of the most important works of western civilization. A passion for classical culture informs many choices at Ovid. That passion extends far beyond wine. Walking into the Nelson home is like taking a trip back to a world that existed two thousand years ago. Ancient books and other works of art are everywhere, but there is no television in sight. The vineyards are divided into essentially two large parcels that sit on Pritchard Hill’s well-exposed elevated plateau at about 1,100–1,200 feet in altitude. Ovid’s smaller block is nestled against Martinez, while the second, larger piece is closer to David Arthur. The dark red soils are rich in iron and clay, but the most striking attribute of this land is the collection of large rocks that had to be removed before the vineyards could be planted. Many of those rocks remain as a testament to what makes Pritchard Hill such a unique place to grow grapes. Today, Ovid has about 15 acres under vine. One of the differentiating features at Ovid is a relatively high presence of Cabernet Franc, which plays a significant part of the blend in vintages 2006-2010 of Ovid, the flagship wine, and is the base of Hexameter. Dollops of Petit Verdot, Syrah and Merlot complement the Cabernet Sauvignon and Cabernet Franc. Of all the estates on this side of Pritchard Hill, Ovid is the property that provides the clearest link with Oakville and the vineyards that lie just below, where red, rocky soils feature prominently in a number of vineyards, including Oakville Ranch, Saunders and the upper blocks of Backus. Winemaker Austin Peterson arrived in 2006 and embodies all of the qualities that are prevalent in today’s generation of young Napa Valley winemakers; namely a hugely inquisitive mind, unrelenting attention to detail and a passion for history. Under Peterson’s guidance, Ovid has released a succession of compelling wines that seem to get better and better with each passing vintage. Ovid's first commercial release was the 2005, which was also the first vintage made at the current facility, but a small amount of wine was made offsite in 2003 and 2004. Ovid, also the name of the flagship wine, is a Cabernet Sauvignon-based blend that has times also incorporated a significant amount of Cabernet Franc. In more recent vintages, Ovid is heavily Cabernet Sauvignon focused, while Hexameter is the wine that most expresses the uniqueness of Cabernet Franc on the property. A penchant for trying new things often results in one-off bottlings that are presented as ‘Experiment’ wines. Ovid also produces a super-distinctive Syrah as well as a new white. In 2010, Ovid released Loc-Cit, a selection of the estate's best Cabernet Sauvignon. The 2013 Loc-Cit remains the single most compelling wine I have ever tasted off the property. 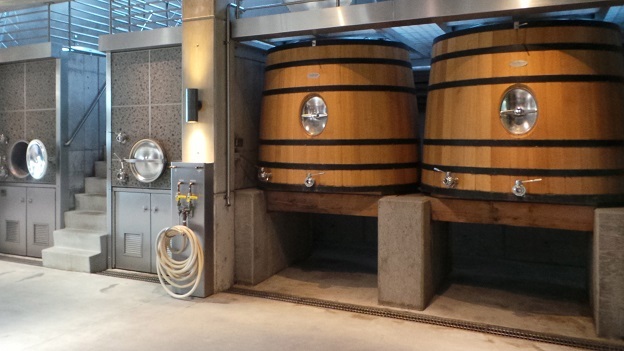 The wines are fermented in oak or cement vats. One of the best times to taste at Ovid is just after the malolactic fermentations, when, arguably, the wines are at their purest, as they have little, if any, oak influence at that stage. 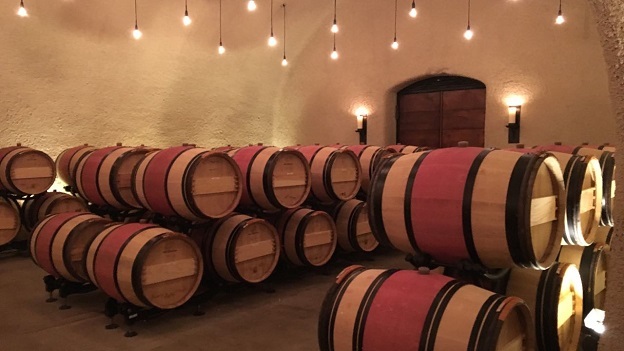 The 2005 and 2006 were aged in 100% new oak, partly because they were the first vintages made in the new winery, and the estate did not want to risk bringing in any outside bacteria from used barrels into the facility. New oak dropped to around 90% for the 2007 has gradually declined to the low 80s, where it is today. Some of the wines, especially in the early vintages, come across as overly technical. That is hardly a surprise given that the vines were, of course, young at the outset and Nelson and Johnson had no experience in making wine. 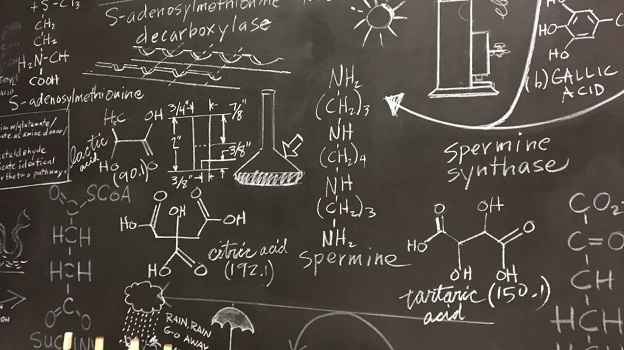 Most disciplines require a strong foundation in technique. Once solid fundamentals are in place, experience and natural instincts can flourish. I expect that is what will happen at Ovid as well in the coming years. The 2005 Ovid is just beginning to show the first signs of aromatic development. New leather, smoke, tobacco, mint and savory herbs give the 2005 much of its aromatic signatures. The 2005 has more than enough depth to drink well for another decade or more. Hints of mocha, blackberry jam and dark spices wrap around the fleshy finish. Even past its tenth birthday, the 2005 is a bit oaky and also a touch alcoholic. Most importantly, though, the 2005 shows just how far Ovid has come over the past decade. Ovid’s 2006 is a powerful, intense wine. Still fresh, vibrant and focused, the 2006 is super-impressive today. All of the site signatures are very much present. Mocha, espresso, dark cherries, spice and tobacco add aromatic nuance. The tannins have softened, but the 2006 has more than enough depth to drink well for another 10 or so years. This is a superb effort in a vintage that is mostly overlooked these days. 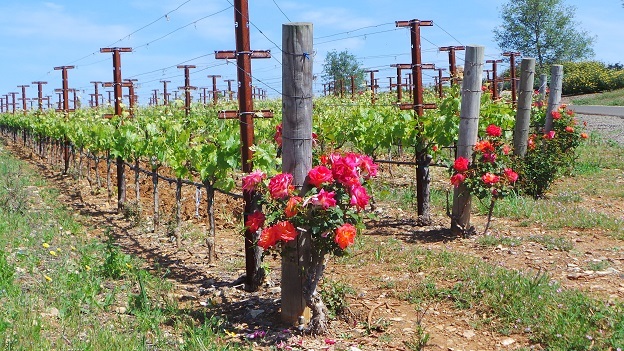 Winemaker Austin Peterson describes 2006 as a year with a warm summer and pronounced heat spike around Labor Day followed by more moderated conditions for the rest of the season. Harvest took place from late September to the middle of October. The 2007 Ovid captures the essence of the year in its deep personality. Broad, ample and creamy, the 2007 is decidedly unctuous in feel. The advancing aromatics suggest the 2007 is best enjoyed over the next 5-7, as there is little to be gained from further cellaring. Mocha, chocolate and a host of torrefaction notes are front and center. One of the highlights among the early vintages, the 2008 Ovid is the first wine in this tasting that is complete in its balance of aromatics, fruit, acidity and tannin. New oak also appears better judged here than in the first releases. Blackberry jam, spice, exotic spices, black cherry, menthol, licorice and lavender are all nicely delineated throughout, with hints of crème de cassis and crushed rocks that add freshness as the wine starts to open up in the glass. The 2009 Ovid is another of the more voluptuous wines in this vertical. Silky tannins and an overall impression of creaminess stand out. Even with all of its depth and ripeness, the 2009 remains fresh, vibrant and capable of drinking well for another decade-plus. Hints of sweet tobacco, menthol and licorice add shades of nuance. The 2009 is a wine to enjoy for its racy curves and flamboyant personality. Today, the 2009 is super-impressive. In many ways, the 2009 also represents an inflection point in the estate’s early history. It was the first year the estate moved to farming the property block-by-block, rather than as one large piece of land. Specifically, decisions on pruning, irrigation and crop thinning were made with much more rigor and focus than in years prior. The first wine in this tasting that still needs time in bottle, the 2010 Ovid is once again superb today. Beams of supporting tannin and acidity give the 2010 its sense of energy and thrust. Another few years of cellaring should allow the tannins to soften and the new oak of to integrate a bit further. Once that happens, the 2010 will be ready to provide thrilling drinking. Black cherry jam, chocolate, plum and mocha infuse the bold, structured finish. Perhaps the biggest surprise in this tasting, the 2011 Ovid is superb. Aromatically nuanced, finessed and silky on the palate, the 2011 hits all the right notes. Next to the other wines in the range, the 2011 is a bit lighter in feel, but in exchange, there is a level of detail and precision that is not present in years such as 2007 and 2009. Frankly, this is an eye-opening wine. Among other things, the 2011 shows what was possible in hillside sites with diligent farming and winemaking in this very challenging vintage. A burst of raspberry jam and sweet floral notes rounds things out nicely. The 2012 Ovid belongs to a group of vintages that includes 2007 and 2009 where the main characteristic is bold, racy fruit. A host of red cherry, pomegranate, smoke, licorice and tobacco wrap around the palate. Juicy, racy and flamboyant to the core, the 2012 needs a few years to lose some baby fat and develop aromatic complexity, but it is impressive. The 2012 is distinctly red-toned and floral in character, as so many wines are in this vintage. This tasting reinforces my view that the 2013 is the most complete Ovid yet. Dark, powerful and vertical in its sense of structure, the 2013 possesses terrific intensity, with a backbone of firm tannin that will allow the wine to age gracefully for many years. I wouldn’t dream of touching a bottle before age ten. Vivid and exceptionally balanced, the 2013 Ovid captures all the pedigree that is such a signature of this great Napa Valley vintage.